You need to try the Beautycounter Overnight Resurfacing Peel! I’ve been bottling up my excitement for over a month about Beautycounter’s new at-home Overnight Resurfacing Peel! FIRST: Let’s clear up a few misconceptions about the name of this new magical spot and line-busting treatment! #1 It does NOT peel your skin. The word “peel” here means that it is dissolving and sloughing off thousands of dead skin cells (invisible to the naked eye), resurfacing skin to reduce hyperpigmentation, dryness, dullness, fine lines and oil-prone areas of your face. #2 You do NOT peel it off your face. It looks, feels and goes on like a serum, and in the morning, you simply wash your face to wash away the dead skin. No extra steps needed, friends! #3 It gives the RESULTS of an in-office treatment but without any downtime, redness, skin peeling, or burning. For some people, the first few applications may tingle, but this just means you’re benefitting from the AHAs! #4 Yes, it’s safe to put acids on your face. In fact, the skin prefers acidic conditions and naturally creates an “acid mantle” on the top layer to protect from environmental hazards like bacteria, viruses, microbes and harsh weather conditions. Alpha hydroxy acids are commonly found in skincare products because of their powerful exfoliating capabilities. How Often Can I Use It? You may use the Overnight Resurfacing Peel at night, after cleansing and toning, and before moisturizing. Start with applying up to 3 nights a week. I have found I can use it 7 nights a week prior to my usual serum and moisturizing routine without any skin sensitivity, but I probably apply it closer to 5x a week to make it last longer. How Do I Use It? Cleanse and tone skin as you typically would. My favorite way to prep skin for the Overnight Resurfacing Peel is cleansing with the Cleansing Balm and toning with the Rejuvenating Toner Pads. Apply 1-2 pumps of the Overnight Resurfacing Peel to face and neck, massaging it in in circular motions to increase circulation. Let sit for 1-2 minutes to dry and allow the actives to penetrate skin before proceeding with your regular oil, serum and/or moisturizer nightly routine. Can Sensitive Skin Use This Product? Yes, just be sure to do a test spot behind your ear to make sure you’re good to go, but generally at-home acids are a great choice for sensitive skinned individuals who cannot tolerate in-office prescription-strength treatments, chemical peels or microdermabrasion. Ask your dermatologist before use if you recently received an in-office chemical peel or are using high-powered prescription creams. Can I use it if I’m pregnant? If you are pregnant, I would just check in with your doctor & let them know it contains a small amount of over-the-counter salicylic acid (oral salicylic acid is the main concern during pregnancy, FYI). I personally would feel comfortable applying 2x a week as a pregnant woman, but I think the decision should be up to you! A 2011 study on skincare safety during pregnancy noted that the amount of salicylic acid that penetrated the skin varied from non-detectable to 25% (when used in high, daily doses, or on open wounds). Okay’s let chat about what’s IN the peel that makes it a product I think every woman and man needs in their bathroom! The Overnight Resurfacing Peel contains 15 total acids including 7 resurfacing AHAs (alpha hydroxy acids) to slough off the top two layers of the skin that have the hardest time shedding. These top two layers are responsible for dryness, dullness, build-up that can cause breakouts, blackheads and large pores, and also where visible hyperpigmentation, sun damage, scarring and fine lines is most evident. Resurfacing the skin means treating and decreasing our most common skincare concerns that our regular routine may not effectively or deeply target enough. 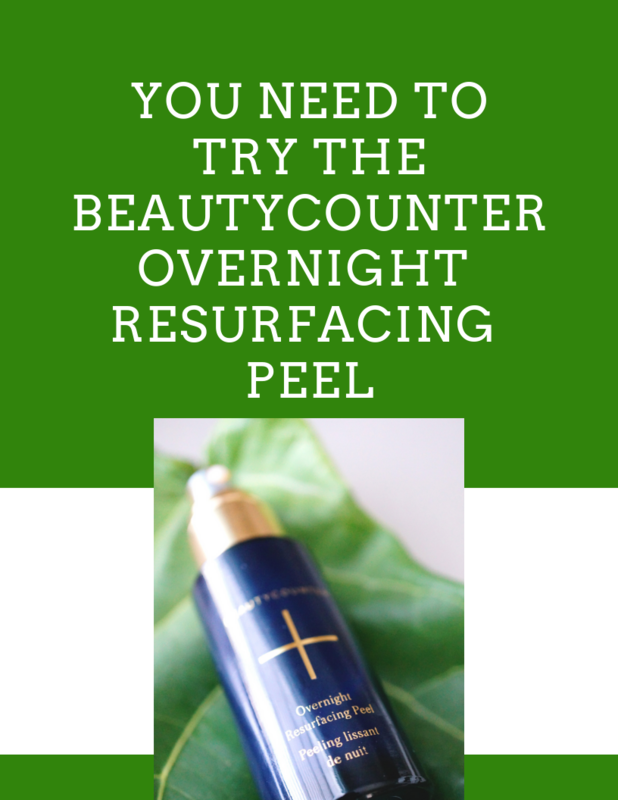 THE BEAUTYCOUNTER OVERNIGHT RESURFACING PEEL IS FOR YOU! GLYCOLIC ACID: sourced from sugarcane, this acid is the one of the most common high-powered exfoliators to treat signs of aging, skin discoloration and melasma. It is also indicated for use in oily skin, blackheads and acne. LACTIC ACID: sourced from fermented sugarcane (to keep this product dairy-free) is another popular AHA that resurfaces skin to reduce the appearance of fine lines, skin discoloration, acne, and dullness. It also helps improve skin elasticity and plumpness by stimulating collagen synthesis. PHYTIC ACID: sourced from plant extracts like beans or oats (no concern for gluten from these extracts, safe to use if you don’t eat oats or beans – it’s not the same as ingesting them at all). Phytic acid’s main benefit is lightening and brightening skin. I have sun damage from growing up in Florida as well as melasma on my shoulder from pregnancy & I saw an improvement in skin evenness after the first night! SALICYLIC ACID: derived from willow bark and probably the most commonly used BHA (beta hydroxy acid), salicylic acid is a workhorse for sloughing off any of the dead skin the other acids can’t get to and an acne healing and prevention powerhouse. MALIC, TARTARIC, ASCORBIC AND HYDROXYSTEARIC ACID: these acids are all powerful in their own way. Malic acid is used to decrease hyperpigmentation, tartaric acid smoothes and evens skin texture, ascorbic acid is a soothing vitamin C-derived acid that brightens skin, and hydroxystearic acid is a safe fatty acid that provides antioxidant support to skin. HYALURONIC ACID: this acid holds up to 1,000x it’s weight in water to provide ultimate hydration, improving skin elasticity and plumpness. As we age, our production of HA significantly decreases, so it becomes important to supplement it in your skincare routine. RASPBERRY SEED OIL: a nourishing plant-based oil that is thought to help with UVA and UVB protection, protection from free radical damage, and hydration to name a few. It also contains phytoesterols which are thought to be beneficial for skin conditions like eczema and psoriasis, although this product is not intended to treat any specific skincare condition.